There is a saying 'one good turn deserves another' - and in Pastor John Greenaway's case, it has proved to be true. He and his family gave shelter to a homeless man in 2016, after a chance meeting in a faith mission book shop. Belfast man Melvin Boyd had fallen on hard times, but said once he met Pastor Greenaway's family and began living with them, his life changed. In turn, Mr Boyd changed a life when he offered the pastor, who needed an organ transplant, one of his kidneys. The story was first reported by the Ulster Gazette. In their first broadcast interview, Mr Boyd said living on the streets was difficult and that he could not trust anyone. After meeting the pastor's son, who brought him to the family home in 2016, the Greenaway family helped Mr Boyd to beat his alcohol addiction and start over. 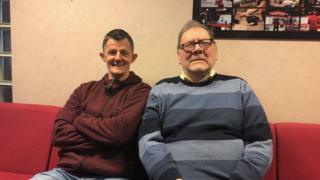 Pastor Greenaway told BBC Radio Ulster's Sunday News programme: "I believed Melvin needed a new start in life, we wanted to help him. "He was different than other people. There are a lot of people who want help but don't want to do anything about it themselves - but Melvin wanted to help himself." Since then, Mr Boyd has stayed at the family home every day and night, and has become another son to the pastor, and his wife, who already have four children. Last March, he repaid the pastor for his generosity by donating one of his kidneys to him. Pastor Greenaway had kidney failure and had been on dialysis for almost a year before the operation. He had three offers from other people to donate an organ, but none of them had worked out. That's when Mr Boyd stepped in. He said: "There was no agonising about it." "The biggest thing about it was God bringing us together. I believe it was meant to be. "I tell other people it's great that John got a new lease of life, but people don't see that I got a new lease of life. "John got a piece of me, but I got a family, a place to live, I got friends, people that care about me, I got way more than John got." Pastor Greenaway said: "How could I ever thank Melvin for what he's done? Words couldn't describe that. "He said it wasn't even a problem to him - and I believe God had already prepared Melvin's heart to give me a kidney. "He will always be a part of me now, and part of my family."